Advanced Heads Up Mastery Review: The Ultimate HUNL Course? Poker is a game that requires many skill sets if you aspire to be a crusher and maintain longevity in this complex game. The games today are tougher than ever and require you to be a well-rounded player if you want to maintain your edge in all situations. Most of your opponents are going to be comfortable for the most part playing in full ring games, but short-handed play is where you can really gain an edge. In this poker training review article, we are going to specifically focus on Head Up No Limit Hold’em. Sure you can crush your local full ring game, but what are you going to do if you find yourself Heads Up in the Main Event for $8 Million+? If past Main Event Heads Up Battles are any indication, your average poker player is completely lost when it comes to Heads Up play. One of the first hands that come to mind took place in the 2016 Main Event. Gordon Vayo was heads-up for the title vs Qui Nguyen. The turning point in the match was when Gordon incorrectly folded to Qui with 2nd pair in a large pot. It is very important to understand absolute and relative hand strength in Heads Up Poker because after all, it is hard to make a pair right? In theory, Gordon’s passive strategy vs an aggressive opponent like Nguyen wasn’t necessarily incorrect, but you have to be prepared to make this call if that is how you are going to approach an aggressive opponent in this way. Without going into too much detail, let’s take a look at Doug Polk of Upswing Pokers analysis of the hand below. Heads Up poker is much more like a Chess Match than full-ring, and if you master this skill you can gain a MASSIVE Edge on your opponents. If we could come up with one person to be coached by in this speciality, it would be Doug Polk. Doug has been widely regarded for years and the best No Limit Hold’em Heads-up specialist in the game. Doug was beasting Heads Up Nose Bleed Stakes online where he first made his name in the poker world. Now that Doug is no longer playing those stakes due to not being able to get enough action and people willing to play him, he has decided to share all of his secrets with us in his Heads Up Mastery course. Upswing Poker probably offers the most comprehensive poker training guides on the internet. The training modules are not only extensive but also created by one of the best players in the game. My full ring game is solid, but with plans to make some deep runs this upcoming 2018, I decided I needed to brush up on my Heads Up Play. 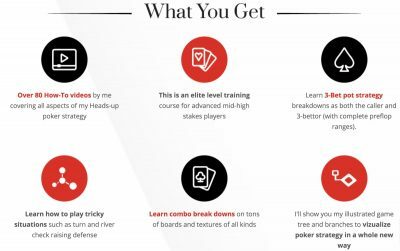 After doing some extensive research I realized that UpSwing Poker’s Advanced Heads Up Mastery Course was my best option – an opportunity to learn from WSOP Bracelet Winner, One for One Drop 3.7 Million Dollar Champion Doug Polk. Polk is the ultimate Heads-Up specialist and has poured his lifetime of expertise into designing and building this exhaustive learning program. The said course consists of around 30 hours worth of video training modules, each of which has been broken down into several subcategories. A fair warning – if you are just starting off in the world of poker and don’t even know what heads up means, then this coursework is not for you. We highly recommend starting with the Upswing Poker Lab course first and then you can progress into the Advance Heads Up Mastery Course. 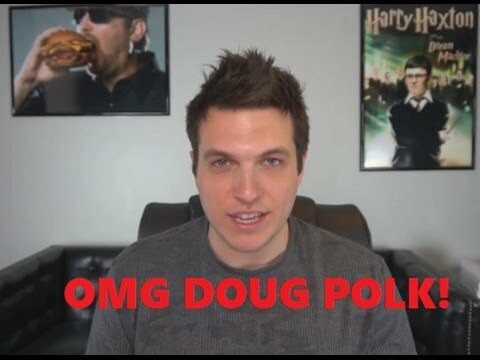 Let us take a look at what Doug Polk has in store for you. Preflop RFI Coursework: For those who aren’t familiar with the Raise First In (RFI) concept, Polk will brush up on the basic fundamentals of Heads Up preflop strategy and ranges before venturing into the more difficult terrain. Polk will show you how to utilize the equity analysis system using PokerStrategy’s Equilab. This is a great visual which will help you decide which hands you should RFI, and help you to understand your equity vs various ranges. Next, he will delve into numerous examples from his own high stakes heads-up matches, concentrating on the preflop strategies used during his heads-up matches as examples. Polk also discusses the big blind strategies and the common Heads Up 3bet ranges. As if that is not enough, you will be provided with a wide range of download links to a series of hands as examples detailing how to proceed with each of them. Preflop 3Bet/4Bet Coursework: Here, Doug Polk will introduce you to the mathematics and situations to implement the 3Bet and 4Bet. Imagine you have pocket aces and the other player has raised your big blind. Should you raise or flat? What do you do with your more marginal holdings in this spot? Polk will discuss all the possible iterations of 3Betting and 4Betting with a strong/weak hand in this coursework. 4Betting preflop can be uncomfortable putting that much money in with marginal hands, but Polk will ease the burden by showcasing its numerous benefits in the long run. Postflop SRP Advanced Heads Up Mastery Coursework: Once you master all of the theoretical preflop strategies, you will be ready to move on to post-flop. Admittedly, the post-flop techniques discussed in this coursework may feel a bit daunting, but the beauty of UpSwing’s courses is they build upon each other with each successive module so you are well versed in the material and prepared for the next module. Preflop is almost like an exact science, but post-flop is where your analytical ability and hand reading will be truly put to the test. We are, after all, entering the realm of the most sophisticated techniques which are difficult to master even for some of the pros in the game. Polk starts off with the strategies involving single raised pots (SRP). SRPs are those pots where one player raises and the other simply call. If you were the one who raised preflop, then should you continue betting post-flop? Should you keep barreling on the turn and the river? All the possible scenarios involving cbets are covered in this coursework. Each scenario is followed up with an example video where the strategy is discussed in great detail. These videos have an average length of around 30 minutes. By the end of each module, you will become adept at realizing when to cbet, barrel, check, raise, or fold post-flop. Postflop 3Bet Pot Advanced Heads Up Mastery Coursework: Here we will move deeper into the world of post-flop mastery techniques. What if you are faced with a 3Bet post flop. Should you 4Bet? The statistics and possibilities are discussed in the form of a ‘Game Tree’. This is a decision tree that will guide you on how to proceed accordingly and always make the most +EV decision. Beware, the explanations become highly complicated from here on out, but fortunately for those taking the course, Doug does an excellent job simplifying these concepts. Polk will specifically point out when to bet or check a 3Bet pot by using examples. He does a great job of not only teaching these concepts but also showing you how to apply them. After he gives a general overview of concepts, he will show you when to barrel or check raise your opponent, when to fire a double or triple barrel, or how and when to delay Cbet. Polk’s ‘Game Tree’ branches out down toward a seemingly endless trunk of possibilities to help simplify and narrow down your decision making process. This is a really cool addition to this course – a detailed analysis of the Doug Polk vs. Ben Sulsky $20000 heads-up game. Ben Sulsky is arguably the second best heads up no limit hold’em player in the World behind Doug Polk. The play-and-explain video included in this course is an 11-part analysis of a 4-tabling session featuring two of the best players in the world of heads-up poker – “WCGRider” (Doug Polk) and “Sauce1234” (Ben Sulsky). This video will not only showcase the legendary match, but you will also find Polk explaining his thought process in every hand. This is extremely invaluable as you are able to see and learn heads-up poker being played at its highest level. The Advanced Heads Up Mastery Course is, without doubt, is the most comprehensive heads up content in today’s market of poker courses. The sheer depth in which Polk has delved into to explain each and every outcome of a heads up game is astounding. After taking this course you will have a whole new appreciation for the game of poker, and a massive edge on your opponents. If you try to take all the knowledge provided in one go, you will definitely be lost halfway through. Take it one module at a time and make sure you really soak up all of the information before proceeding to the next module. The price of the Advanced Heads Up Mastery course is $999 ($949 using the coupon code below), but given the amount of knowledge, you will gain you are guaranteed to see a return on your investment and become the best version of yourself as a well-rounded poker player. 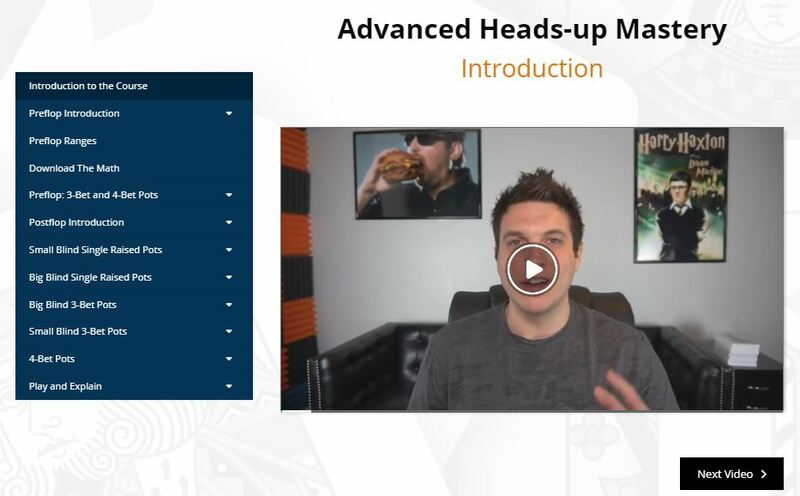 You can also grab $50 of the Advanced Heads-up Mastery course using Upswing poker coupon code Advanced50 by clicking here. There is nothing worse than showing up for a test unprepared knowing you are going to fail. Don’t be that guy that and gets heads up for the Main Event and find yourself completely lost! Start this poker course TODAY so you can be ready for your moment in the spotlight!